There's also a name to attach to yesterday's tower fatality in Watkins Glen - the worker who was killed was Dirk Remington, 46, of Clyde. *A longtime AM voice in southeastern PENNSYLVANIA has fallen silent. Great Scott Broadcasting, which has owned WPAZ (1370 Pottstown) since Herb Scott put the station on the air back in 1951, abruptly pulled the little local AM station off the air Thursday, putting four full-time staffers and two part-timers out of work without notice. Mitchell Scott, son of the station's founder, told the Pottstown Mercury that the station no longer fit with the rest of his company, which is based in Maryland, several hours away - but that he hopes to find a buyer who can get the station back on the air. It's listed with Pittsburgh-based broker Ray Rosenblum for sale. *Another station sale in central Pennsylvania: Bruce Collier has been operating WHYL (960 Carlisle) under an LMA for more than a year now. Under the name "Trustworthy Radio," a partnership with Joseph Green of WWII (720 Shiremanstown), he's converting the LMA to a purchase from licensee WS2K Radio, for $300,000 plus a $150,000 promissory note. Radio People on the Move: Tim Herbster, who was known as "Romeo" on New York's Z100, has rejoined Clear Channel as PD/afternoon drive for WIOQ (102.1 Philadelphia). Herbster, who'd most recently been working with webcaster Goom, will also serve as director of digital content for Clear Channel's Philly cluster. A call change on the shores of the Delaware River: as-yet-unbuilt WQCD (1450 Milford) has changed calls to WDRE. On the TV front, there's a new news director at Wilkes-Barre's WBRE (Channel 28): Jeremy Settle moves north from Newschannel 8 in Washington to fill the slot last held by Ron Krisulevicz. Some neat holiday programming in Pittsburgh: Steel City radio vets Chuck Brinkman, John Summers and Clarke Ingram have joined forces to put together a special countdown of the top hits of 1963, which will air from noon-3 PM Christmas Eve as part of the 60th anniversary celebration at WRCT (88.3). A week later, WRCT's Jay Thurber will be back on the air with a re-creation of the station's 1969 sound, in glorious mono. Thurber, who hosts the retro "Radio 9" show on Saturdays, will count down the year's biggest hits from 9 until midnight, when "1969" will give way to 2010. *Sports radio listeners in central NEW YORK are in for a change next spring, when Ed Levine's Galaxy group takes over the ESPN Radio affiliation currently held by Citadel's WNSS (1260 Syracuse). Starting March 5, 2010, ESPN will move to the new "ESPN Radio 97.7 and 100.1" in Syracuse and Oswego, and to Galaxy's "Game" trio in Utica (WTLB 1310 Utica/WRNY 1350 Rome/WIXT 1230 Little Falls). Those FM frequencies aren't full-power stations - they're translators W249BC (97.7 Mattydale) and W259AX, which is being moved into Oswego, and they'll be relaying Galaxy's AM stations in the market, WTLA (1200 North Syracuse) and WSGO (1440 Oswego), which have been doing satellite-fed standards. In addition to ESPN's national programming, the Galaxy stations will expand on the Syracuse University sports content already being heard on Galaxy's "TK99" (WTKW 99.5 Bridgeport/WTKV 105.5 Oswego), with additional coverage of SU sports. And speaking of the Oswego stations, we're sorry to report the passing of their longtime owner. Bob Gessner bought WSGO back in 1971, put WSGO-FM (now WTKV) on the air a few years later, and ran the stations as paragons of small-town local radio for a quarter of a century. Under Gessner's leadership, the stations moved to their current transmitter location off Route 481 in 1989, when the FM station took on the new calls WGES. Gessner's earlier career had included station management and ownership downstate, including a stint at New York's WCBS and the founding of WBNR (1260 Beacon), which he operated with Sy and Alfred Dresner (yes, "Gessner and Dresner"). Gessner retired in 1996 when he sold the Oswego stations to Galaxy. He died Dec. 5 in Kissimmee, Florida, at the age of 86. *Galaxy's not the only broadcaster making translator moves this week: in Gloversville, Mike Sleezer's WFNY (1440) is buying W233AM (94.5) from Northeast Gospel Broadcasting for $33,600. 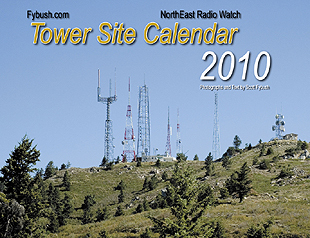 The payments will be made not in cash but as credit towards tower space for Northeast's new WNGG (90.9 Gloversville). 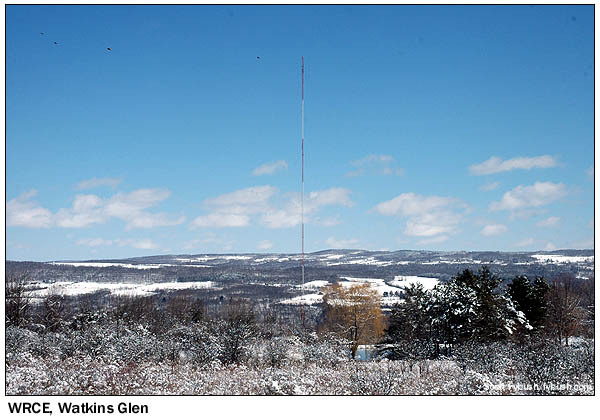 In Watkins Glen, the Finger Lakes Radio Group (which owns WFLR 1570 and an FM translator in nearby Dundee) is buying W270BY (101.9) from Calvary Chapel of the Finger Lakes for $18,000. And in Rochester, the FCC has granted a CP to Family Life Network to move translator W220DE (91.9 Greece) from the west side of town to Pinnacle Hill, shifting to 92.1 with 99 watts. *Radio People on the Move: Egypt is the new middayer at Inner City Broadcasting's WBLS (107.5 New York). She was last heard across town on Clear Channel's WWPR (Power 105.1). Where are they now? Longtime Rochester TV personality Jerry Carr, who made a name for himself doing "The Weather Outside" on WOKR (Channel 13) in the sixties, then served as founding GM of WUHF (Channel 31) in the eighties, is retiring from his most recent job down in Florida. For the last 13 years, Carr has been president and CEO of public broadcaster WXEL-TV/FM in West Palm Beach, and he'll leave that post at the end of March. *Two more from the obituary columns: Paul Godofsky, who co-founded Long Island's WHLI (1100 Hempstead) and WKJY (98.3 Hempstead) with his brother Elias back in 1947, died on Friday (Dec. 11) at age 91. Paul Godofsky served as president of the stations for more than 30 years, until they were sold in the late seventies. And Paul Jeffers, the only man to serve as news director at both WCBS (880) and WINS (1010) when the stations were competitors, died Dec. 4 at age 75. *In MASSACHUSETTS, Lady D is out after four years on the night shift at WBMX (104.1), her latest stop in a long career that's also included WXKS-FM (Kiss 108), WZOU/WJMN (94.5) and WQSX (Star 93.7). She did her last airshift at Mix 104 on Friday; no replacement has been named yet. On the public radio side, WBUR-FM (90.9 Boston) quietly reversed some of the weekend schedule changes that had listeners complaining last week. "Speaking of Faith" was back on the air at noon on Sunday, followed by the briefly-cancelled "Marketplace Money," and "Wait Wait..." is now down to just three airings each weekend. For more than three decades, PD Oedipus handled Christmas-eve duties on WBCN (104.1), building a following for his unusual collection of holiday music - but with no WBCN this Christmas, Oedipus is moving to his former competitor. WFNX (101.7 Lynn) invited Oedipus to bring his show down the dial this year, and he'll be behind the board from 6 until midnight that night. *In NEW HAMPSHIRE, part of the "Morning Waking Crew" at WOKQ (97.5 Dover)/WPKQ (103.7 North Conway) is missing: Danielle Carrier did her last show on Friday, we're hearing. *There's a new AM station on the air in CANADA's capital region. About a year and a half ago, we'd passed along some erroneous reports from DXers who though they'd heard test transmissions from "Radio Enfant," CJEU (1670 Gatineau QC). The French-language children's station wasn't on the air then - but it really did begin testing this week. And a longtime Ottawa station manager has died. Jack Daly was sports director and then general manager of CKOY (1310, now CIWW) and CKBY (105.3, now CKIS) from 1951 until 1979. He died Dec. 8. It's been almost 18 years since a massive ice storm paralyzed us here in the Rochester area, leaving some areas without power for more than two weeks. And it's been just over a decade since an even more massive ice storm struck an area stretching from northern New York up through eastern Ontario and into much of Quebec, knocking power out to some areas for as long as a month. By those standards, the ice storm that hit central MASSACHUSETTS, southern VERMONT and NEW HAMPSHIRE on Friday was relatively minor - but even "relatively" minor is still a big deal for people everywhere from Fitchburg to Lowell to Peterborough to White River Junction, for whom it could still be a while before things are back to normal. The good news is that, at least as this column is being written on Sunday night, there are no reports of any downed towers in the region. What the massive power outages are demonstrating, however, is a surprisingly large number of stations apparently lacking working generators at either studio or transmitter sites. Much of the Worcester market was knocked off the air in the storm's first hours, including both news-talk AMs, Clear Channel's WTAG (580) and Carter's WCRN (830). WCRN remained off through Saturday, but WTAG was soon back on the air with nonstop emergency information, and still going strong late Sunday. There have been widespread power outages along much of the Route 2 corridor to the north, with numerous stations off the air everywhere from Athol to Fitchburg to Lowell and Lawrence. On the TV side of things, we note the start of local HD newscasts at WBZ-TV (Channel 4) and sister station WSBK (Channel 38) on Thursday, which we believe leaves only Fox's WFXT (Channel 25) as a major local-news player in Boston without HD. But WFXT has bigger concerns at the moment: after many months fighting problems with its aging analog transmission system, we're hearing that WFXT's analog signal finally gave up the ghost for good last week, leaving only WFXT-DT (RF 31), which is not yet at full power. Interestingly, WFXT had just last month submitted an STA application to the FCC asking for reduced analog power (293 kW visual) through the end of the transition period, due to "recent, partial damage to the licensed antenna." Another Bay State analog TV station - albeit one that mainly serves RHODE ISLAND viewers - has gone dark. New Bedford-licensed WLWC (Channel 28), the CW affiliate for the Providence market, turned off its analog transmitter on December 9, leaving WLWC-DT 22 behind. A veteran PENNSYLVANIA jock is back on the air: Greater Media has hired Glenn Kalina as the morning man on WNUW (97.5 Burlington NJ), making "Now 97.5" the latest stop in a career that's included WZZD, WCAU-FM, WIFI, WIOQ, WLCE and WMWX. Kalina starts at "Now" on January 5. MASSACHUSETTS - and the nation - lost one of the great ones last week. Since 1976, David Brudnoy had entertained, educated and, often, irritated audiences on WHDH (850), WRKO (680) and - starting in 1986 - the 50,000-watt night signal of WBZ (1030 Boston). In 1994, Brudnoy came to the nation's attention when he revealed that he was suffering from AIDS. After a viral infection related to the disease put him in a coma for nine days and kept him off the air for ten weeks, Brudnoy returned to the air with a reduced shift (7-10 PM instead of 7-midnight), a new studio (in the library of his Back Bay home) and a profile raised by appearances on national TV and the publication of his memoirs, Life is Not A Rehearsal. Brudnoy's illnesses continued to take him off the air occasionally in recent years, but it quickly became clear that his latest absence, which began on December 1, was a serious one. Last Wednesday, Brudnoy gave an interview to WBZ anchor Gary LaPierre in which he announced that his Merkel cell carcinoma had spread to his liver and kidneys and that he did not expect to live more than a few days. Wednesday night's Brudnoy show, hosted by former WBZ personality and close Brudnoy friend Peter Meade, took the form of an on-air wake, with Brudnoy listening from his room at Massachusetts General Hospital as politicians, authors and average listeners called in to say how much Brudnoy had meant to them. At 6:11 the following night, Brudnoy succumbed to his cancer. He was 64. There was other news, in MASSACHUSETTS and elsewhere, ill-equipped as we were to deal with it in the face of the sad news from WBZ. Over at sister station WODS (103.3 Boston), veteran New England programmer Pete Falconi (late of Worcester's WXLO) takes over as music director and midday host, filling the shoes of the departed Sandy Benson. In yet another corner of the Infinity Boston cluster, the changing of the guard continued at WBCN (104.1 Boston), where afternoon jock Nik Carter, one of the last remaining veterans of the Oedipus era at the rock station, is out of a job, with his contract not being renewed and no replacement named just yet. On any other week, the sudden death of a veteran upstate NEW YORK morning man would have been our lead story, and we're saddened indeed to have to report the passing of WBEE (92.5 Rochester)'s Bill Coffey. Bill started at WBEE in 1988, not long after the station flipped to country, and he held down mornings there until he was forced to return to his native southeastern Pennsylvania to care for his ailing father. Three years later, the departure of his successor, Fred Horton (now in Erie, Pennsylvania at WXTA) created an opening at WBEE, and thanks to the modern miracle of ISDN, Bill was once again hosting the "Coffee Club," this time from the comfort of his home in Glenmoore, Pennsylvania. The show worked, though, thanks to local co-host (and WBEE veteran) Terry Clifford and frequent visits to Rochester by Coffey. After a show last Monday that went without a hitch, the staff at WBEE was shocked to get a phone call later in the morning saying that Bill had suffered a heart attack, collapsed and died. He was just 56; he leaves behind his wife, Barbara, and three children. Otto's broadcast career began at the old WBNY (1400) in Buffalo at the tender age of 19. After two years in the Navy, Otto spent the rest of his five-decade tenure in Buffalo radio, most of it with WGR (550), where his "Extension 55" and "Night Call" were the city's best-known talk shows in the 1960s and 70s. Otto took a detour to WWKB (1520) for a few years in the mid-80s, then returned to WGR for the rest of his career. For the past year, Otto did his 10PM-1AM shift from his home, as his health deteriorated and he became unable to get to the WGR studios. In 1998, Otto was named to the Buffalo Broadcast Pioneers' Hall of Fame. Otto was hospitalized last weekend after suffering a fall at home. As news of his death spread Monday morning, the response was immediate from across the Buffalo media community, exemplified by WBEN's Sandy Beach: "We have lost our teacher." WGR devoted its Monday and Tuesday night shows to remembrances of Otto. John Otto was 70 years old. In other news from the Empire State, there's now a format war in Rochester -- in adult standards, of all things! Just like it did in Dallas and Denver this fall, Crawford Broadcasting has dropped the religious format from WDCZ (990) in Rochester, replacing it with a locally-generated (or at least very slickly voice-tracked) standards format as "Legends 990," WLGZ(AM), complete with PAMS jingles. The religion continues on WDCZ-FM (102.7 Webster). WLGZ goes head-to-head with dial neighbor WEZO (950), whose standards format is entirely satellite-delivered, not to mention pre-empted by Spanish nightly from 7-9 PM. We heard CANADA's newest AM station using its calls this week. CINF (690 Montreal) is getting ready for next Tuesday's launch as "Info 690," and the signal both day and night in Rochester sounds an awful lot like that of the old CBF from its Brossard, Quebec transmitter site -- but it's not! A last-minute message from Sheldon Harvey up in Montreal informs us that 690 is diplexing off the CIQC (600) site, while English sister "940 News" (whose calls will in fact be CINW, not the previously-announced CKNN) is diplexing off French-language CKVL (850)'s towers a few miles to the east. Weekday programming on CIQC and CKVL wrapped up with Friday's shows, and weekend programming will conclude Sunday, with Monday being a dark day on all four frequencies before Tuesday's 11 AM launch of Info 690 and 940 News. Simulcasts will reportedly continue on 850 and 600 for up to six months.